If you're moving into your brand new home or if you're tired of staying in the same boring space of yours then it's time to transform your dull and monotonous house into a peppy, fun, cozy and beautiful place with a limited budget! Wait, the best part is yet to come! You don't have to hire professional decorator or designer to do little bit changes who'll charge you with hundreds of dollars. You can be your own designer and decorator and the boss of your house as you know exactly what you want. But don't worry about how it'll end up, whether good or bad, you can always start a new DIY project without spending a fortune. Married Wiki has rounded up top eight DIY Ideas to decorate your house with style and fun. It's always better to hang up some abstract art work or posters on the walls with all those spaces. But be careful while you choose the paintings or artwork that counter-complements the color of the wall and theme of your room. You can always go to a local thrift store or clearance rack of a department store and choose some picture frames that speaks nature or abstract art or concert posters. 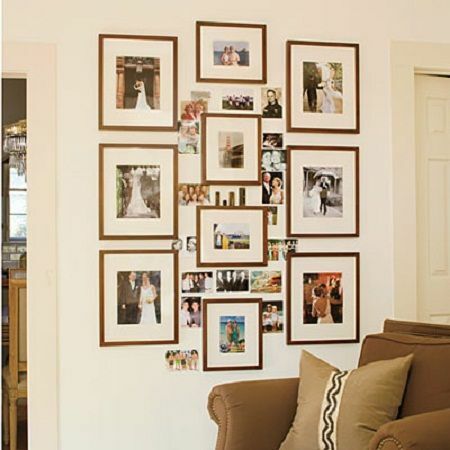 If not then you can create your own wall of fame, sticking your favorite pictures in an organized way. Let's admit it. The Front Portion of your house is the highlight and it'll definitely impress the guests. Add fresh color and unique style to your front porch which you can do by adding a stylish yet artistic vase with red roses or rosemary and other greens. Not only this, you can play with some color as well and paint the front wall with bright colors like red or purple or yellow, that'll complement the entire house. You can add funny door mats or even a patio with a cute coffee table and chairs! If you have a set of rustic shutter windows then it'll be perfect to create the junk into a marvelous shutter side table. Skip expensive furniture and make your own table to put potted plant or vase of blooms. You need four wood shutters, 16 screw nails, one piece of glass for table top and 8 art canvas stretchers. There's always an extra space in your backyard and it always confuses us what to do with it, whether use it as a playground for the kids or a barbeque spot or a garden. What if we say you can add all these things at once. But first, it's always best to convert your back yard into a beautiful garden. Greenery never hurts our eyes and a garden in your house will definitely take your home decoration to the next level. On top of that, you can squeeze in some extra space for barbequing. Not only this you can create a tree house or a play house for your kids and you as well, to relax during the summer. It doesn't require much labor and neither it's expensive. Talking about creative, napkins comes least in our minds but you never know how napkins will re define your kitchen tables. Use the old use napkins and dye it with a bright color like pink or purple or turquoise blue and create an ombre effect on them. The faded hues will give a fresh look on your kitchen table and the best part of this is you don't have to spend a single penny! Correct Lighting greatly affects the aura of the room and when the lighting is not perfect then no body wants to stay longer in your room! Lighting is something which you have to take care of yourself and you can DIY lighting which is super fun to do anywhere, starting from your bedroom to living room as well. Use string lights by hanging them on walls in an artistic way or if you have a wall full of pictures then you can hang on them! Not only this, you can stick colorful shades from old tees or leggings to make them into a colored lampshade! When it comes to decorating your home, most of us forget about the bathroom. The bathroom also plays a vital role in uplifting the status of your house and it won't hurt to have a stylish bathroom. Don't worry guys, you don't need expensive hind wares or fixtures for this. First, you can paint your bathroom with wild colors like indigo, brazilwood, wood, and other and if a painting is not your style then you can use attractive wall papers to decorate your bathroom. On top of this, throw in some aromatic candles or colorful shower curtains to add more zing! The kitchen is basically the heart of your house. It's not just a place for cooking and eating, it's the place where we make our best memories. Whether it's a just a dinner for two or a gathering, there's no other place than this, where we want to be. And for a special place like that, it's important to have a decorative touch, that looks cozy and comfortable too. If you have free space on your kitchen wall, don't be afraid to add shelves. Shelving unit will facilitate you to hold all the crockeries, plates and serving pieces. Choose your dining table that complements the theme of your kitchen. Use neutral furniture like white or ivory tables with different textures if you have a white ceiling. So, if you find this column interesting, stay with us, as we'll cater you with of more DIY topics and life hacks! !